Not only the title of the “New German Bedside Lamp” is reminiscent of the “New German Design” of the eighties. Its make, additive construction, and brutalist materiality also remind us of these years on the move into a new style of living and home décor. However, this design should not be regarded as a mere reminiscence of these times, but as a contemporary confrontation with the aspect of simplicity – and that never grows old. 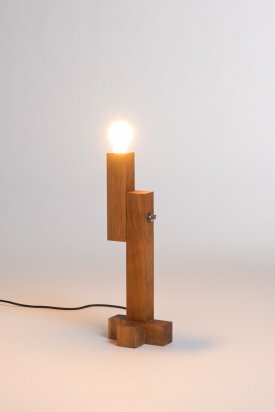 Even less so when the designed object, here a lamp, embodies a simplicity thus far unknown in this category. 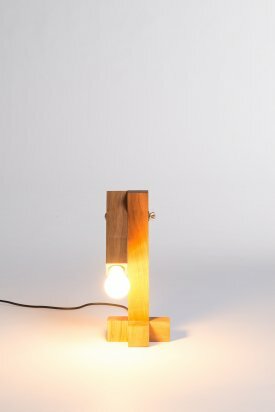 The lamp consists of only five square-cut wood posts of different lengths, a wing nut, and the necessary electrical hardware. These parts, however, have been composed in such a precise and well-proportioned manner that they make up a whole that is anything but hulking, or even ungainly and dilettante. Quite the contrary: This lamp gives off a type of archaic elegance that makes us forget many a filigree high-tech instrument.